After I witness a transformative set of music, this is what inevitably occurs when the dust settles. After a band plays high energy, pedal-to-the-metal music for a cool 100-minutes, it’s difficult to ascertain which pieces stood out as the highlights among many other highlights – the crème de la crème. That’s why I try to balance dancing and having fun with taking notes in the middle of a song or right after it ends. It’s the only way I can filter the musical narrative and determine the truly supernal from the “merely” superb. Jay Rattman didn’t have that luxury. 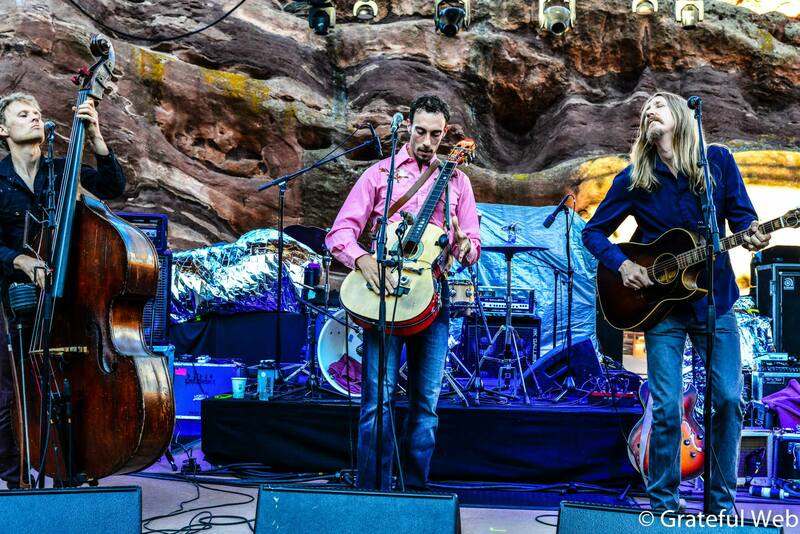 His quartet, The Mile High Horns, sat in with Railroad Earth last Saturday at Red Rocks and, together, created a second set of symphonic wonderment. When I asked Rattman, who arranged the pieces and played alto saxophone and clarinet, to recall his personal highlight from the many possible contenders, he imparted me with the words you see above. I couldn’t blame him. Without my notes, the second set would have also been a blur, homogenous in its beauty and monolithic in its magnetism. During Tuba Mirum, I wrote: “Interplay between RRE and MHH is outstanding. Perfect. Locked in. Listening to each other like a dectet that has been playing together for years.” What I didn’t know at the time was that the four musicians comprising the Mile High Horns were a one-off group that never even played a show together before Saturday night, much less with the sextet who headlined. And that made last Saturday’s feat even more remarkable. But before I delve into that masterful second set, along with the backstory of how it came to be, I would be remiss to not zoom out a bit and capture a really solid beginning of the night. After a truncated set by The Wood Brothers, and a full one from Greensky Bluegrass, Railroad Earth took the stage just before 9:30 and chose a very poignant opener: Long Way To Go. With its message of hard work and humility, it struck me as a concrete gesture from the band to its fans. 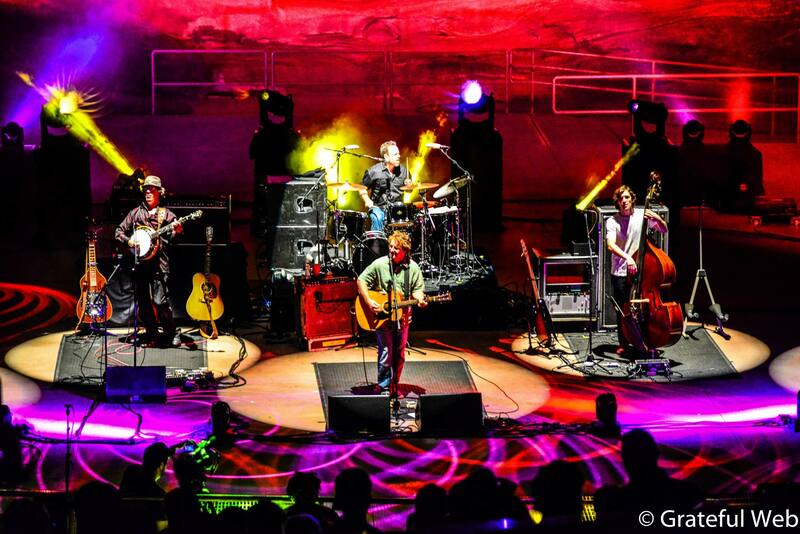 Railroad Earth headlined Red Rocks for the first time in 2013 and is currently enjoying more popularity and success than at any time in its 13+ years together. Despite these achievements, the band still tours regularly and shows no signs of inertia or creative lethargy. 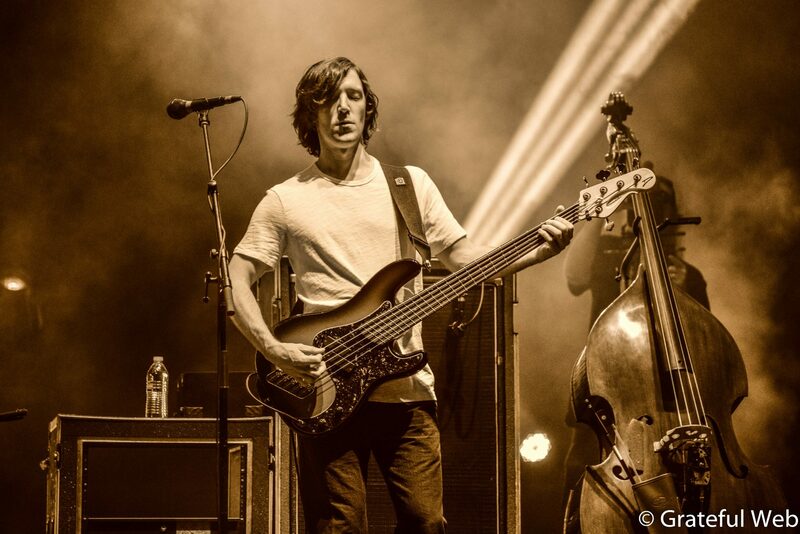 Walk Beside Me, a song bathed in bluegrass funk, came next. I was entranced by Andrew Altman’s hypnotic bass line which also doubled as the melody. John Skehan and Andy Goessling laced gorgeous mandolin descants throughout and Altman took an understated solo near the end of the piece. The set began to really percolate with the fast-paced coupling of Drag Him Down > 1759. Drag Him Down lit a fire under my feet and I was dancing intensely to its jubilant bluegrass picking. Altman and drummer Carey Harmon pushed the tempo. After the third refrain, they essentially ducked out (except for Harmon’s hi-hats) so we could hear Todd Sheaffer, Skehan, Goessling, and fiddler Tim Carbone tearing up the melody in a flurry of notes that all seemed to wind together and fit perfectly into each beat. Exhibitions of mastery like this four bar interlude made me smile from ear to ear. The transition into 1759, led by Harmon’s snare work, was relatively simple, but nonetheless as seamless as segues ought to be. I only realized a new song had begun when I heard Skehan pick a set of notes on his bouzouki that sounded like they belonged in a western. This piece was the highlight of the first set because it managed to portray a symphony of sound both potent and muscular, yet somehow delicate and refined – almost like listening to a rock ‘n’ roll Irish reel. Harmon and Altman, on his upright bass, propelled the band with their blistering tempo while Carbone wowed the Red Rocks crowd with his fiddle solo. It started as a fluid series of counterpoints to the bass line, but then he went higher in octave and unfurled cascades of notes into the crescendo. Finally, Carbone, along with Goessling on mandolin, locked in to create a dual melody to close out this fulgent rendition. After a straightforward version of the achingly beautiful Bird in a House, Carbone rekindled the flame from 1759 with another exquisite solo during Carrying Coal to Newcastle. Skehan took the reins first, introducing fluttering bursts of tremolo with his mandolin, and then he handed duties off to his bandmate. Listening intently, Carbone scaffolded from Skehan’s work with his own melodic phrasing and even echoed the tremolo inflection in a few bars. As that solo unfolded, Skehan moved right next to Goessling (acoustic guitar) and they both ornamented the fiddle work with texture and color that made the whole piece a robust offering. When the Sun Gets in Your Blood closed out the hour-long first set. This relatively new piece, written by Altman, provided a perfect distillation of Railroad Earth’s sumptuous and spiritual sound. Harmon’s tom work and Altman’s (upright bass) picking imparted the song with a pillowy rhythm. Banjo rolls from Goessling and Sheaffer’s acoustic strumming articulated a melody to match the sublime gentleness of the rhythm. And finally, Carbone’s electric guitar and Skehan’s mandolin fills, harmonious augmentations, and airy solos completed a sonic landscape filled with a beauty that is at once rooted in the soil and grass, but at the same time, floating in the firmament. 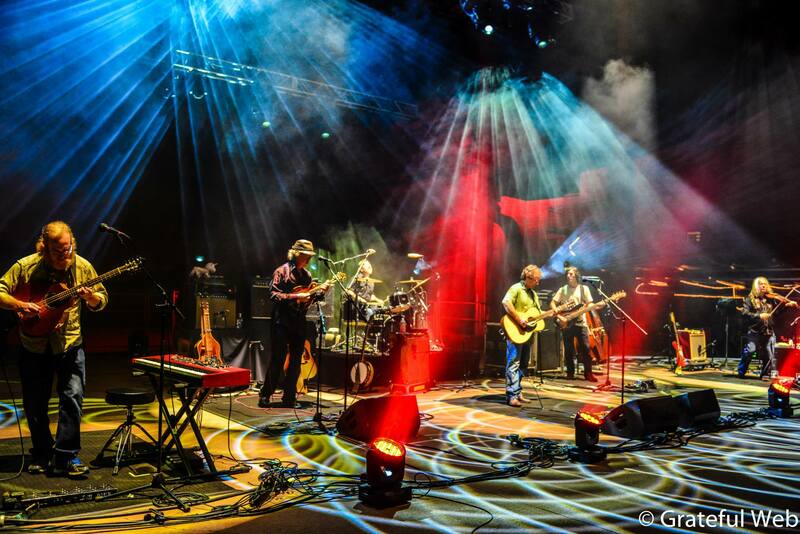 In other words, Railroad Earth’s music feels tangible – but it also transmits a sense of the ethereal. After a half-hour break, the second set started in an unusual manner. Four guest musicians, playing almost shoulder-to-shoulder behind Skehan’s area on stage right, began belting out a New Orleans brass-band standard on tuba, tenor and alto saxophone, and trumpet. It looked like Goessling was also assisting on his saxophone. Bit by bit, the rest of Railroad Earth took the stage and joined in the merriment for a couple of minutes until the intro segued into Monkey. After Monkey, the horn section stepped down for a couple of songs. Dandelion Wine, which (I think) is the band’s most frequently played cover (Neal Casal), is nonetheless one of my favorites. There’s an energy to its execution that always makes me want to dance in circles – it feels like a hybrid of swing and bluegrass both pushing the envelope together. After that scorcher, Sheaffer dedicated the next song, Railroad Earth, to his parents who flew here to see him at Red Rocks. And this gives me an opportunity to touch upon something I haven’t mentioned yet – the vocals. Sheaffer has a voice that is perfectly tailored to his band, though it is certainly outside the realm of “conventional” lead vocalist. He has belted out this favorite hundreds of times and tonight he sang it with such passion and heart that it felt like it was new to the rotation. Not only that, the relatively stripped down instrumental parts also showcased the gorgeous backing harmonies of his bandmates. When the lyrical apex arrived – “Oh mama, ain’t it good to be alive?” – the crowd roared with approval. I stretched my arms out, pointed my chest to the sky, and realized how lucky I was to be in the here and now. 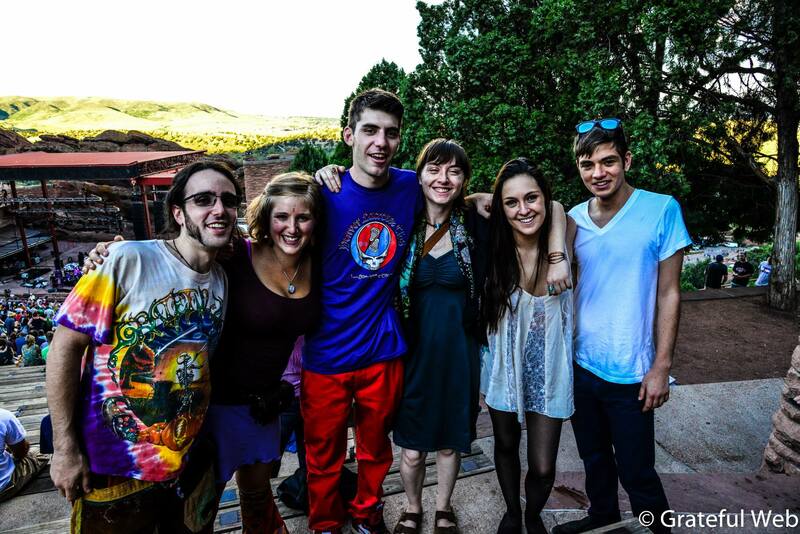 The Mile High Horns stepped back in for the relatively rare Hangtown Ball. The first third of the song felt a little stilted and wet, but that soon changed. Skehan switched from mandolin to electric piano, injecting a bit of ragtime into the verses. Then Sheaffer took a modest solo as the jam began to build steam. Once Rattman took the wheel, though, the entire piece came to glorious fruition. His alto sax solo was perfectly phrased to sound like a jazz centerpiece while the rest of the band hit the cradle of the groove for a heavy funk jam to support him. At the beginning, the other three horns were watching Rattman and then, as he was digging deep, they returned in unison with elongated swells to bring the entire piece to a rousing crescendo. That two-minute segment was easily a highlight of the second set. The horns stepped out once again and Harmon drummed the opening beat to Elko on his snare. With the tempo shifting upwards from Hangtown Ball, the crowd was dancing up a storm in my vicinity. And we were treated to another scintillating fiddle solo from Carbone. Elko segued into Tuba Mirum which showcased the brilliance of the Mile High Horns. This instrumental started almost immediately as a powerful jam and then each of the four guest musicians began weaving in the same theme in different parts, almost like they were playing a fugue. It was visceral, verdant, and insanely beautiful. About three minutes in, the tempo rose from deep, bouncing funk up to faster-paced jazz-pop and then, two minutes later, returned to its original theme. I could be wrong, but I’m pretty sure this is where the Allen Touissant/Rock of Ages note from Carbone came into play. Tuba Mirum was one of the three biggest highlights of the night. It was a pre-dominantly composed piece that was not only deftly executed but also invoked the dynamism of music that’s novel and spontaneous. Face with a Hole allowed The Mile High Horns another opportunity to exhibit their prowess with a rich tension and release trope that built into an eventual mountain of sound with heavy horn modulation. Mighty River was all about Carbone. 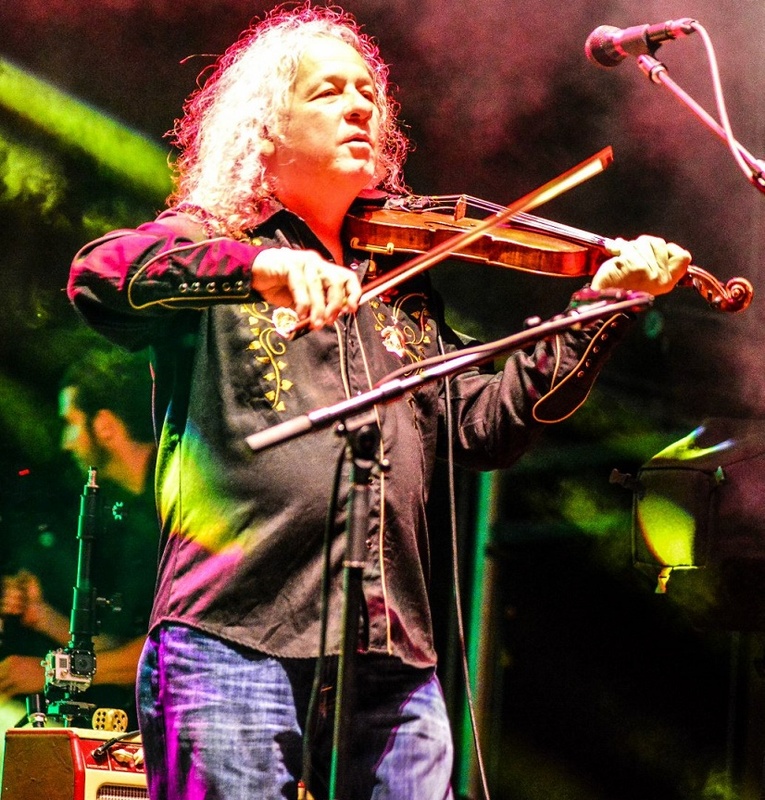 I loved watching him solo on his fiddle, the fog machine going full blast in the background, his eyes closed, and hair being blown back like some modern guitar (fiddle) god. With the opening reel riff for Like a Buddha, Railroad Earth embarked on, in my humble opinion, the singular musical apex of the evening. The horn section generated momentous bursts and swells to support Goessling’s flute intro melody. Sheaffer’s voice changed noticeably – he belted out the lyrics with so much vigor one could easily be convinced that his livelihood depended on it for this one moment in time. The second set was rife with energy before Like a Buddha, but the ten men on stage took it to a new level. The middle jam was both fluid and crisp, a perfect constellation of instruments building a lattice of up-tempo, dance-heavy sound until it peaked and disappeared into Sheaffer’s vocals during the last verse. The final jam is one of those I can’t really describe. It’s rather pointless to try. I’m sure there’s a copy on the archives. Check it out. It’s ridiculous. Sheaffer introduced the penultimate song by telling the Red Rocks crowd, “We’ve been coming to Colorado for quite some time now. 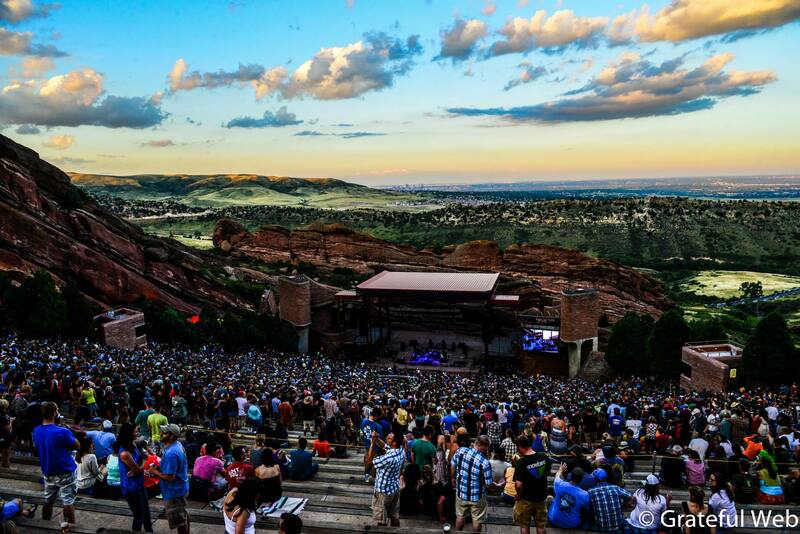 It was one of the first places we played…We always look forward to coming back to Colorado in the summertime.” And then the band embarked on the Colorado. 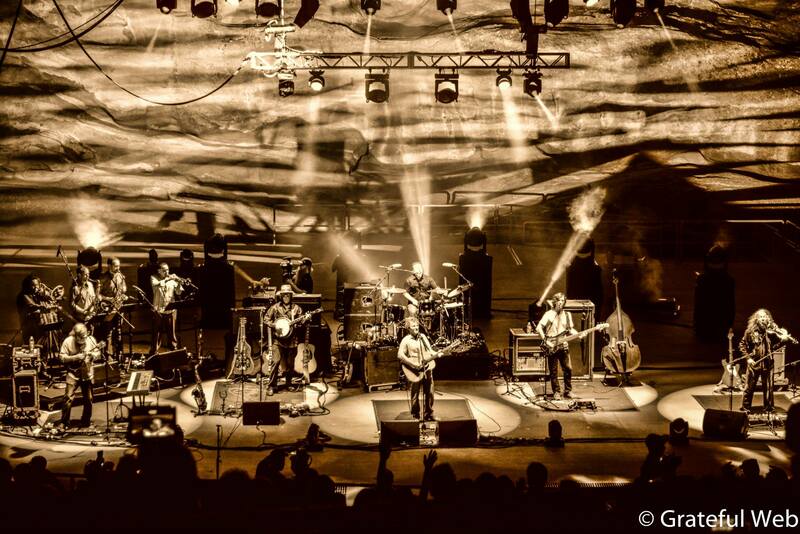 With The Mile High Horns ceding the stage to the sextet to finish things out, the Red Rocks crowd was treated to classic Railroad Earth: robust jamming bolstering Carbone and Skehan as they traded solos – twice. Fiddlee closed out the second set with Skehan and Goessling on mandolin and Carbone on (of course) fiddle pushing the tempo to its maximum possible threshold. They picked and bowed the melody in amazing unison as Altman (upright) and Harmon, using primarily his snare drum, matched their pace with a rhythm that seemed like it was almost daring them to pick faster. This was my final peak of the evening and I danced the rubber off the soles of my sandals. I was filled with joy, yet out of breath, when the final notes echoed off the rocks and into the night. For the encore, One More Night on the Road gave both Railroad Earth and The Mile High Horns one more opportunity to blow the amphitheater away, which it promptly did. I loved the swing element that the horns brought to the table for this piece – a great way to end the evening. And although Psycho Killer seemed like an odd choice for outro music, the crowd was so happy that everyone around me was singing it at the top of their lungs as we filed out of the stands. 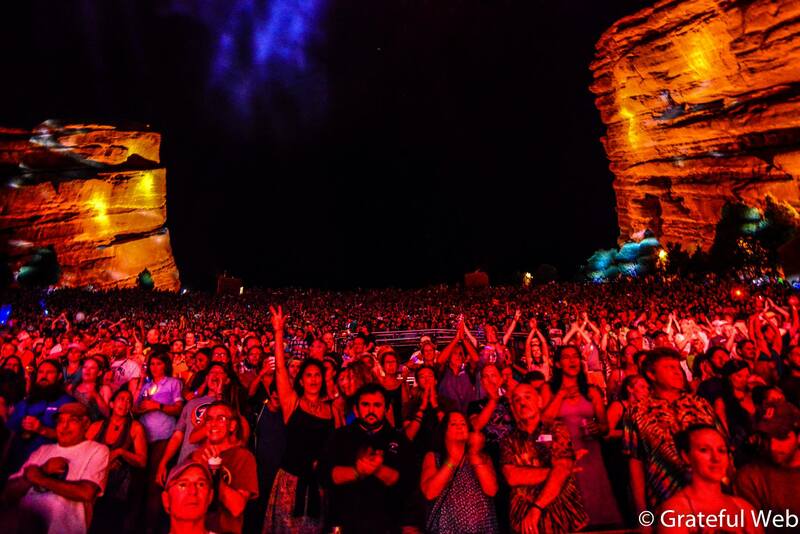 There aren’t many Red Rocks events were I go home disappointed. 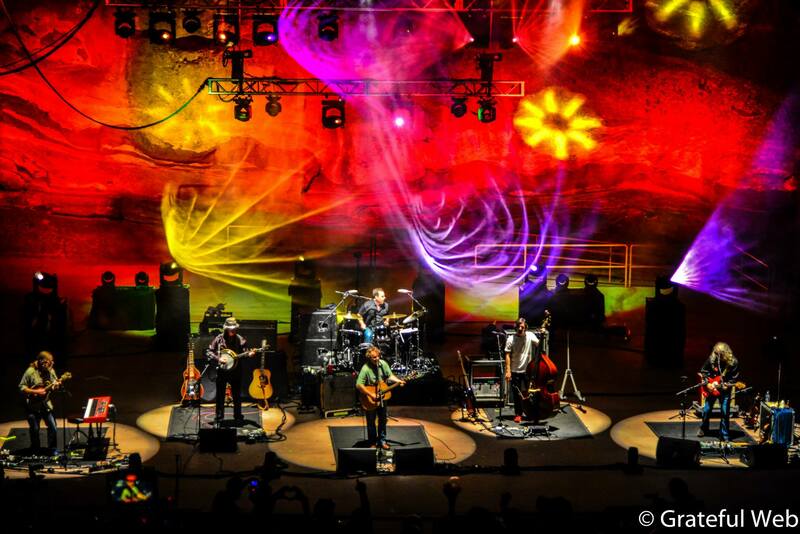 But due to the second set last Saturday, I will hold dear this Railroad Earth show for many years to come. It left me as sated as one can be, but also with great anticipation for the band’s return in 2015. Who knows what sweet surprises it will have in store for us next year? 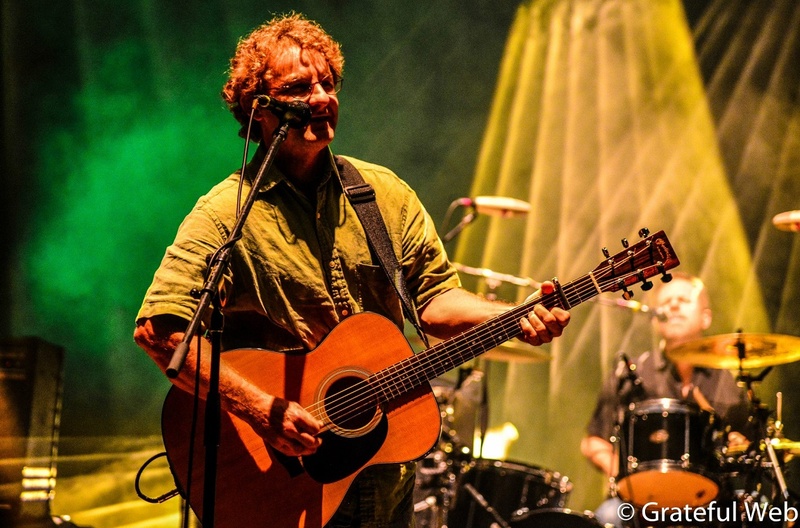 Check out more photos of: Railroad Earth, Greensky Bluegrass, and The Wood Brothers.